The continued global rising sugar production and the current relative lack of a future demand for sugar has resulted in increasing stocks. The fall out is we are seeing sugar being traded at 20c/lb, down from a 27.40c/lb average in 2011. The main reason for the slow uptake in sugar is the price relative to corn sweeteners and the fact that the returns are still greater for sugar than ethanol which influences the Brazilian cane production. The increasing global surplus will be tempered slightly by the falling prospects for the Australian, Russian and Thai harvests. For the increased sugar stocks to be sold, the price will need to be below the domestic market prices which are influenced by governmental policy or the domestic sugar industries. The Chinese have been the world’s largest importer this year, but this is likely to fall by half for 2012/13 as a result of governmental support to restock national supply. In India traditionally the world’s second largest exporter, they are now an importer and like the Chinese the domestic price is predicted to be above the world price to encourage domestic production. 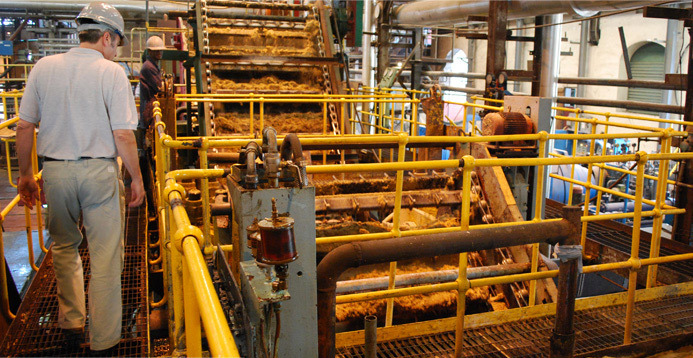 Sugar cane crushing in Barbados. Over the last 4 years, some industrial users of sugar have switched to using corn syrups as a result of the recent high sugar prices, the difference to corn was 15c/lb in 2011 and is currently 7.6c/lb. This softening of sugar prices and increase in corn price is resulting in industrial users switching back to the more favourable sugar option, particularly in China where they are reliant on corn imports, while the domestic sugar price is reducing, all be it still at a 50% premium to corn. The Chinese government will also limit future corn sweetener production by preventing new processing plants being built. In Brazil, the world’s largest sugar producer, sales of sugar cane derived ethanol are down 35% due to governmental capped price of 17c/lb compared to the current 20c/lb for sugar. Despite the Brazilian’s continuing increase in demand for fuel, Petrobras the country’s largest petrochemical company made their largest loss for 10 years as a result of having to import gasoline which it loses money on, due to restrictions on cane derived ethanol. From the next crop an additional 2.5 million tonnes of sugar will go to ethanol production, but with predictions of this cane crop being 30 million tonnes bigger than the current crop, this additional uptake will not affect the rising sugar surplus.